Jay-Z's Unplugged album just popped up on my shuffle. Now, I like Jay-Z just fine. But the fact that he considers himself "the greatest rapper alive"--and more importantly, that this is so widely accepted--seems weird to me.What does that mean, exactly? What makes a person the greatest rapper alive? Best storyteller? I choose Andre 3000. Best hairdo? Kid 'n Play get my vote. Most complex rhyme structures? I dunno. Me? The rapper with the hottest wife? He definitely gets the title there. Uncle Rico:"So what do you think?" For almost a year, I've been kicking around the idea of a music blog that only features albums that are good from start to finish. I still haven't gotten around to it. But if I had, this record would be on there. Though there are a few lesser moments in the middle, Millencolin singer Nikola Sarcevic sure put out a great debut solo album in 2004, Lock-Sport-Krock. The bookends, "Lovetrap" and "Vila Rada" are the best moments. I just finished writing my record reviews for the week when I noticed something interesting. I was using Google Documents to the type the thing and I clicked the word count tool to make sure I had met my guidelines. Each of my reviews was about the same length, but the reading level was quite different. My Bouncing Souls review--a punk rock record by a band that I absolutely love--is written at a 6th grade level. The Vampire Weekend review--a good album by a band that sings about diplomats' sons and other WASP-y things, and who drives me a little bit crazy--is at an 11th grade level. While I'm not bothered that I generally write like a 12-year-old (come on, it's rock 'n roll, not rocket science), it's weird that you have to write like a 16-year-old to talk about a snooty band that college kids like. In 2009, The Bouncing Souls celebrated two full decades as a band by releasing a new digital track each month. "Ghosts on the Boardwalk" serves as the proper album release, and also shows that the years have been kind to the New Jersey foursome. Songs about throwing toilets off the roof or falling in love with a buddy's mom have given way to more introspective tunes, but the invincible punk rock spirit remains. That's not to say they've lost all their immature ways. On the cleverly titled "Badass," they simply shout all of the things worthy of being deemed badass, including, among others, "Black eyes! Muscle cars! Metal!" More than just documenting the 20th year in their career, "Ghosts" is a solid reminder of what an amazing band The Bouncing Souls have become. And the great songs just keep coming. Expectations have always been extremely high for Vampire Weekend--in 2008 they appeared on the cover of Spin Magazine, before they had even released a record. Fortunately, their debut was successful in both living up to the hype and delivering undeniably catchy tunes about yachts and ivy league colleges. 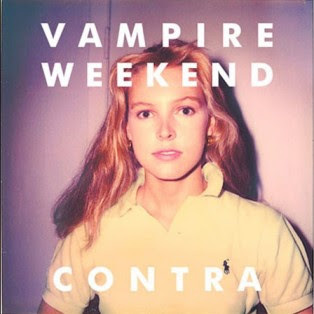 Wisely, Vampire Weekend stay on the same course with "Contra." Afro-pop beats are plentiful and singer EzraKoenig's voice floats beautifully above his polo shirt and plaid shorts. The band pushes their boundaries a bit with the herky-jerky rhythms of "California English" and the electro and falsetto-infused "White Sky," without straying from its strengths. These college kids are smart. Traci told me this story, so try to imagine Traci's librarian voice when you read it. Curtis spent the morning walking around carrying an empty wrapping paper roll. I couldn't figure out why he kept calling it a "boom." Until he hit me with it and exclaimed, "Boom!" As usual, there' s a couple of great tracks on Alicia Keys' record, Snoop Dogg doesn' t have much to say other than that he's a extraordinary lover, and Robbie William's album is a snooze fest. I was busy shaping young minds this morning (at Jadee Talbot's second grade class), when my cell phone rang. I didn't answer it, but the caller left a voicemail. "Hello, this message is for Andre Smith. This is Mr. Steenblik at the Netherlands Consulate." I was excited that the Netherlands Consulate was calling me, but sad that I wasn't Andre Smith. I called back to let them know that they'd left the message on the wrong phone number. A secretary answered. "Hi, I just received a call from Somebody Steenblik, but I think he had the wrong number." "Oh, do you know which Steenblik called you? Everyone here is named Steenblik." Apparently, "Steenblik" (which translates to either Stone Look or Stone Can. I choose Stone Can) is the "Smith" of the Lowlands. "Um, I'm not sure. I guess I could listen to the message again and call you back." "Hi, I listened to message. It was Mr. Steenblik." And that's when I should have said, "I'm looking for a job or internship in The Netherlands where I can live there for the summer with my family but have plenty of time to do sightseeing all around Europe." "Well, tell Mr. Steenblik I said 'Hi.'" Recess was over. Back to shaping young minds. 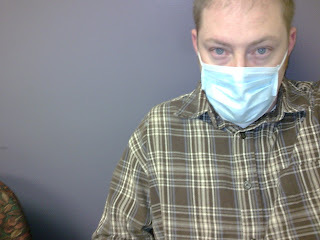 This is what you have to go through just for your doctor to tell you your cough will go away on its own so stop being a baby. Taking on a whole decade wasn't easy, but here's a stab at my favorite albums of the 2000. I didn't have any real rules when I put this together, other than only selecting one album from any given artist. I didn't worry about choosing records that were the most important or critically-acclaimed or whatever. Mostly, their the albums I spent the most time listening to or that have additional meaning for me. Also, I didn't put a whole lot of time into the actual numerical rankings. I wrote the little album descriptions for IN. I certainly would have written them differently had I only done this for my blog. But it took so long that I don't want to go through that again, especially since I'm not getting paid. Death Cab for Cutie - Transatlanticism (2003) Death Cab became the poster band for indie rock, thanks to this absolute masterpiece. From the opening rock of “The New Year” to the yearning closer “A Lack of Color,” every note is perfectly placed. Nada Surf - Let Go (2003) Though they disappeared after their '90s novelty hit "Popular," Nada Surf quietly reemerged with a spectacular collection of understated songs about fruit flies, roller coasters, and Bob Dylan. Daft Punk - Discovery (2001) With "Discovery," Daft Punk morphed from talented knob-turners to larger-than-life robots. The duo successfully blurred the line between human and extraterrestrial, and more importantly, made all life forms dance. Samiam - Astray (2000) I didn't know that punk rock could song so sad, so utterly hopeless. Samiam was emo before emo, in a good way. Kylie Minogue - Fever (2002) Every track here is a dancehall masterpiece. Perfect. The Arcade Fire - Funeral (2004) The Arcade Fire proved two things with their debut album: A) With great songwriting, rock music can sound just as good with violins and accordions and B) Sad songs never go out of style. Jimmy Eat World - Bleed American (2001) After perfecting meandering atmospherics on their first two records, Jimmy Eat World took a more direct approach on “Bleed American.” Every song was direct and finely crafted. The Streets - A Grand Don't Come for Free (2004) Who would have thought that one of the decade’s best rap albums would come from a white British guy? Mike Skinner's concept album about losing and rediscovering love and his 1,000 British Pounds infinitely expanded hip hop's borders. The Format - Dog Problems (2006) – When it comes to a breakup, there’s nothing worse than deciding who gets to keep the dog. This Arizona duo tries to mend broken hearts with pop rock songs that flirt with rock opera. The Strokes - Is This It? (2001) With their leather pants and tight jeans, The Strokes were the antithesis to all things nu-metal. Though they seemed like they were from some indeterminable place in history, everyone knew that time was cooler than the now. Bad Religion - The Process of Belief (2002) When co-founder Brett Gurewitz came back into the fold, Bad Religion found a renewed vitality, writing some of the best punk rock songs of their three-decade career. Millencolin - Pennybridge Pioneers (2000) Swedish punks Millencolin took the art of California skate punk to the next level on their third LP, mixing in just enough rock ‘n roll to blaze new trails. Streetlight Manifesto - Everything Goes Numb (2003) Former Catch 22 front man Thomas Kalnoky singlehandedly raised ska from the dead with incredibly catchy horn lines, speedy punk rock guitar, and his raspy, rapid-fire vocals. Outkast - Speakerboxx/The Love Below (2003) "Hey Ya!" alone was enough to make this double disc great, but track after track of wonderful absurdity is what made it amazing. Pedro the Lion - Control (2002) With this concept record about righteousness and infidelity, David Bazan solidified his spot as one of the best storytellers in indie rock. Matt & Kim - Matt & Kim - (2006) Who needs guitars, anyway? Lovey dovey couple Matt & Kim make delightful dance punk with beat-up keyboards and a three-piece drum set. Weezer - Green Album (2001) Though Rivers Cuomo hides his heart on this one, the hooks were just too huge to hide. Kanye West - 808s and Heartbreak (2008) TAuto-tune was already played by the time Kanye put it on his record, but he found a way to use it not as a gimmick, but as a tool to turn his broken heart into robotic steel. Saves The Day - Stay What You Are (2001) This is how an emo record is supposed to sound—soft, loud, nostalgic, slightly hateful, and more than anything, sincere. Blind Pilot - 3 Rounds and a Sound (2008) The album rarely rises much beyond a whisper, giving it a hauntingly beautiful aura. Here’s hoping that the follow-up will be as impressive as this debut. Bishop Allen - The Broken String (2007) For “The Broken String” no instrument was off limits, even if no one in the band really knew how to play them. The record’s simplicity and eagerness is matched only by its memorable tunes. Eminem - The Marshall Mathers LP (2000) He takes low-blow shots at his mother, dreams of killing his wife and shoving her body in the trunk, and inspires fans to do the same. In 2000, Eminem was both musically crazy and real-life crazy. The crazy ones always make the best music. Silversun Pickups - Carnavas (2006) Silversun Pickups’ first LP picks up right where Smashing Pumpkins’ “Gish” left off, with nasally vocals and fuzzy guitars. The band skillfully gives each song the room to wander to its destination. Iron & Wine - Woman King (2005) By this point, Sam Beam had already released plenty of gorgeous country tunes, but adding dirty Appalachian rock into the mix opened up an entirely new side of Iron & Wine. Hot Hot Heat - Make Up the Breakdown (2002) At the turn of the century, indie bands were hell bent on making kids dance. Hot Hot Heat easily made the best dance-rock record of the decade. I'm feeling lousy today but still had to teach the Young Men. After my lesson I went into the nursery to get Curtis and take him home with me. The kids were listening to a story, but when I scanned the chairs I couldn't see him anywhere. Then I looked at the front of the class and saw one kid standing on his head. "Come on, Curtis," I said as I shook my head. "Let's go."